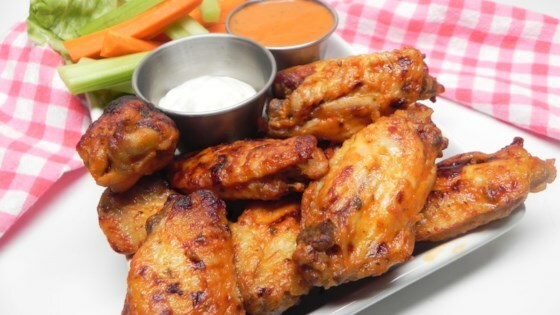 "Buffalo wings made simple in an Instant Pot® and without the fry. The Instant Pot® cooks these to perfection. They hold together for easy handling but as soon as you sink your teeth into them, they are fall-off-the-bone tender. Serve with carrot sticks, celery, and ranch if desired." Pour water into a multi-functional pressure cooker (such as Instant Pot(R)). Set trivet inside and place wings on top. Secure the lid, seal, and select Manual setting. Cook on high pressure according to manufacturer's instructions; set timer for 10 minutes. Allow 10 to 15 minutes for pressure to build. Mix wing sauce and ranch dressing mix in a large bowl. Line a baking sheet with aluminum foil. Release pressure carefully using the quick-release method according to manufacturer's instructions, about 5 minutes. Unlock and remove the lid carefully. Transfer wings to the bowl of sauce using tongs. Toss to coat. Place a wire baking rack over the foil-lined baking sheet and arrange wings on top. Set an oven rack about 6 inches from the heat source and preheat the oven's broiler to high. Broil wings for 5 minutes. Flip wings and cook until crispy, about 5 minutes more. Toss with any remaining sauce if desired. Loved it! Added a little garlic powder to wings before cooking. They were easy and yummy! Very tender. I needed to broil them 7 minutes a side to get them crispy. Definitely plan to make them again! I never get tired of eating wings. This recipe is a keeper. Excellent recipe and fall off the bone goodness!